New Head Offices of PGGM Insurance Company from Josep Lluis Mateo. The Catalan architect Josep Lluís Mateo, founder of the Mateo Arquitectura practice, presents the new head offices of the PGGM insurance company in the city of Zeist. 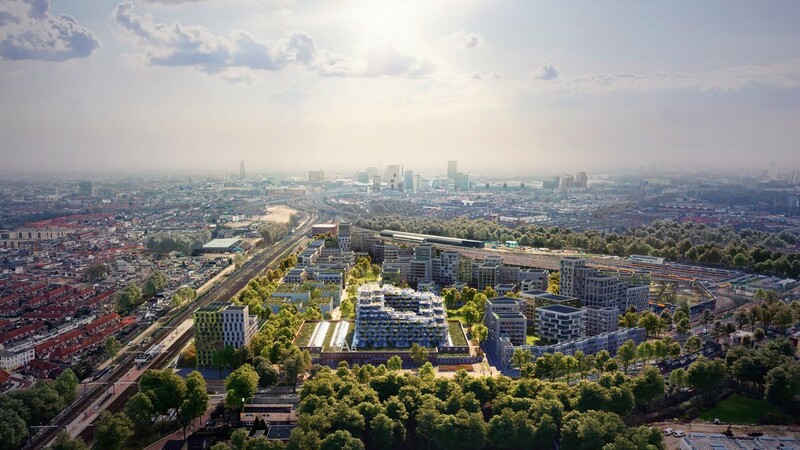 The aim of the project is to extend the central offices of Dutch pension fund PGGM, duplicating their current surface area on the site in Zeist, near Utrecht. This project addressed the need to increase the surface area of the existing building and recover the parkland in which it is set, while maintaining the relation between the construction and its setting. The result is a building that mimics its natural context, creating a visual and aesthetic harmony and integrating the existing building by making the most of its full potential. The indoor space is designed to provide the flexibility required by contemporary corporate activity, offering spaces with multiple possibilities to allow workers to choose the place they work at all times according to their professional and personal needs. Work was also infused with a spirit of innovation at the service of sustainability, with systems of ventilation built into the false ceilings to filter outside air naturally and condition the various spaces, which represents a major energy saving and frees the building of the tubes and machinery that visually and acoustically interfere in the workers’ environment. PGGM Company Headquarters extension Works. Construction of a new building. Located nearby the city of Zeist, close to Utrecht, the tender put forward the requirement for increasing the offices in the current building by 25.000 m2, and at the same time recover a park by means of the construction of a 25.000 m2. underground car park. The project takes into consideration the relationship with the environment and the surrounding neighbourhood buildings in order to maintain compactness which recovers the logic of the increase in size of the initial building. The PGGM Company Headquarters extension works and the construction of the new building are in a well advanced stage of progress. By doubling the current surface area, the project will extend the PGGM pension fund headquarters in Zeist, near to Utrecht. 1 Clear all the land adjacent to the current building and construct a large underground car park and demolish various service pavilions. This would give way to the appearance of a large private park with no roadways, which would be the new context for the building. 2 Part of the extension would be built on the inside of the large patio resulting from the current building, which would greatly improve internal communications and bring life to the centre which is currently too empty. The building would be made of reflective glass and floating stainless steel. 3 Towards the outside and in keeping with the current building open shape, the new working areas would use the landscape created as a nearby exterior reference. 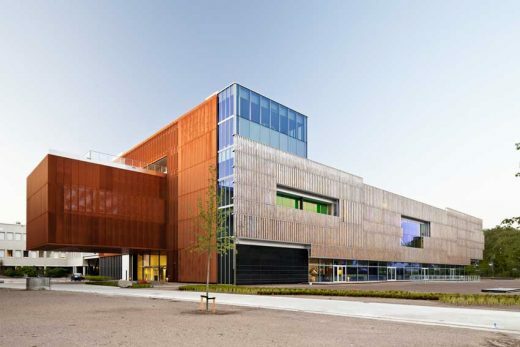 They are repetitive glass buildings plus outside protective wood, corten steel cladding or canvas which would produce a textile warp in the cladding which supplements the glass reflecting abstraction. The internal spaces supplement the usual working space areas with new communication and informal working areas, with a “La Rambla” longitudinal layout. The auditoriums, the restaurants … are special functions that make the unit far more complex than the typical office flexible characteristics and casual areas. This is explained by being the headquarters of a great multinational company. The inside area will, therefore, be very varied and different. PGGM Building from Josep Lluis Mateo.